My background in golf started with the David Leadbetter Golf Academies (Ranked the #1 golf schools in the world for many years). When I played high school and college golf, I worked on my game with Leadbetter instructors while they were in the Chicago area and then down in Florida. I've played in a few professional tournaments including a 3rd place finish in the Illinois Women's Open. I've also studied the golf swing under several other top ranked instructors and tour players. All my experience of being around top coaches and players has helped me develop my teaching method that is focused on correct swing fundamentals. I have been teaching golf for over 10 years. Before starting my own golf school at Links and Tees, I was a golf professional at some top clubs in the Chicago area. 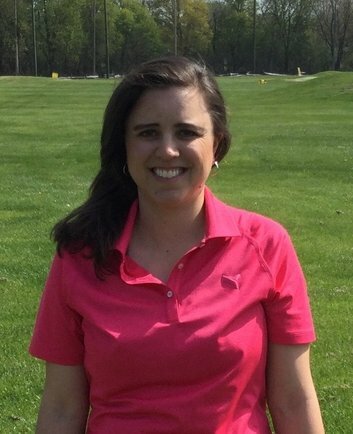 I taught golf lessons at Schaumburg Golf Club and Hinsdale Golf Club while working as an assistant golf professional. From my experience of giving thousands of golf lessons, I have developed a simple and effective teaching method which helps golfers of all levels play their best. My simple approach to teaching the golf swing enables students to make dramatic improvements because I help them understand what they are doing. Some golf instructors can make the golf swing seem overcomplicated for the average golfer. Most people don't have all day to practice their golf swing so I teach an easy method that can have you improving at a faster rate and with less effort. I give the same amount of attention to every student I teach whether they are trying to break par or just starting out as a beginner. I am excited when my students of all levels are reaching their goals from beginner to scratch golfer. Lessons are offered year round at the Links and Tees Golf Range, and we have an indoor golf dome where winter lessons are available. Our outdoor lighted driving range is open from 8am-10pm daily during the summer. For more information on Links and Tees, a nationally ranked top 50 golf practice facility, visit The Links and Tees Website. I welcome any communication and can be reached by calling 630-781-5622 or by email at golfgrl83@gmail.com. Contact me anytime to find out more information or to schedule your lesson(s). I look forward to hearing from you! "Sarah - I played yesterday and had the best round ever. You have done more for me in one hour than 3 other instructors have totally. I really appreciate that." "I was not hitting my irons crisply the last 2 years and after 2 lessons with Sarah I am finally hitting the ball with compression and straighter and farther of course! Her teaching is very easy to understand and implement with practice and playing on the course. She is now my new teaching pro."